The Egyptian pyramids and tombs of its ancient pharaohs are renowned over the world, but few outside China are familiar with the Eastern Royal Tombs of the Qing Dynasty (1644-1911), the largest, most complete and best-preserved extant mausoleum complex in China. The site, located in Zunhua county in Hebei province's Tangshan city, is only 125 kilometers northeast of Beijing. Most of Tangshan was destroyed by a magnitude 7.6 earthquake in 1976 that caused the largest loss of life from a quake in the 20th century, but the tomb complex was largely unscathed. There are many explanations for the mystery - including ancient architectural techniques and outstanding feng shui - but the undisputed fact is its structures remained standing while others nearby collapsed. Indeed, the location's feng sui is considered among the very best. The mausoleum complex is embraced by five major mountains, with two rivers flowing to both east and west like belts of jade. When Emperor Shunzhi (1638-1661), the first emperor of the Qing Dynasty, went hunting in the area, he was deeply impressed at the natural beauty and harmonious surroundings. He decreed that his imperial mausoleum would be built there. 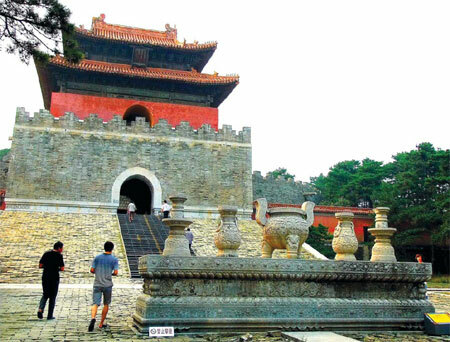 Records show that five emperors (Shunzhi, Kangxi, Qianlong, Xianfeng, and Tongzhi), 15 empresses, a dowager empress, 136 imperial concubines, three princes and two princesses of the Qing Dynasty are buried at the complex. All imperial mausoleums at the site follow a pattern established by the Xiaoling mausoleum for Emperor Shunzhi. The basic layout has three sections: spirit way, palaces and offering kitchens. The tomb of the Qianlong Emperor (1711-1799) - the fourth emperor of the Qing Dynasty - may be the most splendid of all royal tombs in Chinese history. Documents from the era record that the tomb, which is called Yuling, had the finest tomb chamber comprised of a series of nine vaults separated by four solid marble doors located at a depth of 54 meters. Beginning at the first entryway, all walls, vaulted ceilings and gates are covered with images of Buddhist cosmology - its four heavenly kings, eight bodhisattvas and 24 Buddhas as well as ritual instruments and more than 30,000 words from Tibetan scripture and Sanskrit. The three-ton doors themselves have fine reliefs of bodhisattvas - beings on the road to enlightenment - and four protective kings usually found at temple entrances. After hundreds of years, each bead on the strings held by the bodhisattvas can still be clearly counted. Toes and fingers are delicately and vividly sculpted. The Qianlong Emperor selected the site for his mausoleum in 1742 and construction began in the following year. Although completed in 1752, it was expanded further in the years between 1755 and 1762, when a square, memorial tower, citadel and two side halls were built. Called Ding Dongling, the tomb of Empress Dowager Cixi stands out for its extremely luxurious decorations. Its Long'en Hall along with eastern and western side halls is made from valuable red timber. All three halls are decorated with gold-glazed colored painting, gilded dragons and carved stone rails. Everywhere there are reminders of the Forbidden City, such as the terrace-corner spouts carved as water-loving dragons. The interior has motifs strikingly painted in gold on dark wood, recalling the buildings where Cixi spent her last years. The Yuling and Ding Dongling mausoleums were looted by troops under the command of warlord Sun Dianying. Precious burial objects like jewelry and manuscripts were ransacked. The memoir of a looter said that when the Empress Dowager's coffin was opened and a legendary luminous pearl was taken from her lips it was so bright that it outshined the torches held by troops. What happened to the fabulous relics remains a mystery. Today in the underground palaces, the coffins of the Emperor Qianlong and the Empress Dowager are open to public view. Although few burial objects are left, the well-preserved architecture still reminds visitors of the imperial past. The mausoleum palaces amid the looming mountains and surrounding greenery are peaceful and solemn places, reminding visitors that unlike the Forbidden City built for living emperors, its is a place for the imperial dead, who in some ways remain powerful and extravagant, if only in the imagination of visitors.